A healthy balanced diet ensures a healthy lifestyle, keeping various illnesses at bay. This means that your health literally depends on what you eat. The food that one chooses plays a major role in helping the body in building cells as well as other basic functions such as self-repair. While we have various supplements that claim to offer you enough nutrients and vitamins, you can also get these vitamins from natural sources. Zinc is one of the minerals that play a crucial role in our body especially when hair loss is concerned. Many research shows that zinc is one of the crucial components that the body needs. In fact, our body requires a delicate balance meaning that too much or too little leads to various issues including hair loss. Hence Zinc For Hair Loss. To help you understand the crucial role that zinc plays in our body, we have prepared a detailed guide that shows the importance of zinc, where to find it, and how much you need. Zinc is crucial for our bodies as it is involved in various biochemical processes including maintenance of normal levels of hormones as well as cell production. It also plays an essential role in the absorption. In addition, zinc is also actively involved in protein synthesis. As you probably know, proteins are needed for both growth and repair of cells including those in the hair. The zinc plays crucial roles in the body, which would otherwise not function properly. As mentioned earlier, if you are suffering from hair loss or hair thinning it could be because of having too much or too little of zinc in your food. We have various scientific studies that show the issues associated with having too much zinc or deficiency in your diet. In addition, deficiency of zinc in our body(1) ( also referred as hypozincemia) is a nutrient deficiency that is caused by mal-absorption of the element. A number of diseases including the renal disease, diarrhea, chronic liver disease, cancer, and diabetes contribute this condition. It is crucial to note that the deficiency of vitamin D and vitamin A can also cause a deficiency in zinc. One of the main sign that indicated zinc deficiency is a loss of hair (we are going to discuss other signs later). If this deficiency is not addressed, it can cause other serious conditions such as impairment of cognitive and motor skills in children, baldness, weight loss, pneumonia, distressed gestation in pregnant mothers and many more. While zinc deficiency cans result at any age in both women and children, there are certain groups that are likely to have this deficiency. This includes the elderly, alcoholics, anorexics, and people on restricted diets as well as individuals suffering from diseases that lead to malabsorption. As stated before this is one of the primary signs of deficiency in zinc. When the body doesn’t get enough zinc, it leads to weakening of the cells responsible for keeping healthy. This results in thinning of hair making it susceptible to breakage. This will also result in low hair growth and when this is left untreated, it leads to baldness. Zinc deficiency will also make our immune response weak, putting us at risk of various diseases and infections. The weak immune system translates to fewer white blood cells, reducing our body disease and infection fighting ability. This means that you are more likely to succumb to various diseases and infections. Additionally, since zinc is one of the primary minerals that are required in the repair of the cells of the muscles, insufficient zinc in the body may also lead to weight loss as well as muscle wastage. Zinc is also known to suppress appetite. While this might be good for people who are looking to lose weight, it can lead to various conditions such as anorexia in healthy individuals. There are many dangers of leaving this condition untreated. When left untreated for a long time the deficiency may reveal itself in form of other signs including skin lesions, reduced fertility, acne, as well as psoriasis. It is also crucial to ensure that you get enough vitamin A and D as deficiency of these vitamins could result to zinc deficiency. For this reason, you should ensure you consume foods that are rich in these vitamins before you adjust your zinc consumption. If you are not sure of the levels of the vitamins to consume, you should your doctor. They will run a test to determine the levels of vitamins and minerals you have. This way you can know exactly what to do in case of any deficiency. Our hair is mainly made of two proteins namely, keratin and collagen. When there is a deficiency in zinc, it leads to changes in the proteins, weakening their structure. When this continues for a long time, it eventually leads to thinning of hair and baldness. Zinc deficiency will also decrease the sebum production. Sebum is natural oil that is secreted by the scalp. This oil plays a crucial role in ensuring the hair follicles are healthy and strong. Deficiency of zinc is not the only concern that you need to be aware of as too much of it can also lead to various condition that affects the hair growth. When there is excess zinc in the body, it will cause an increase of sebum production to abnormal levels. The excess oil will combine with the hair products, dead skin cells, as well as an environmental pollutant. When this happens, there will be the formation of plaque layer on your scalp. The layer will then make the hair suffocate by cutting off the supply of amino acids and nutrients. This will also eventually lead to thinning of hair. Having too much of zinc in the body will also increase the testosterone levels. This may be crucial in the health reproduction of men but too high levels may interact with certain enzymes such as five alpha-reductase. This will lead to dihydrotestosterone (DHT) production. When there is the formation of DHT, it will lead to the reduction of hair follicles in some individuals that have hair loss genetic predisposition. 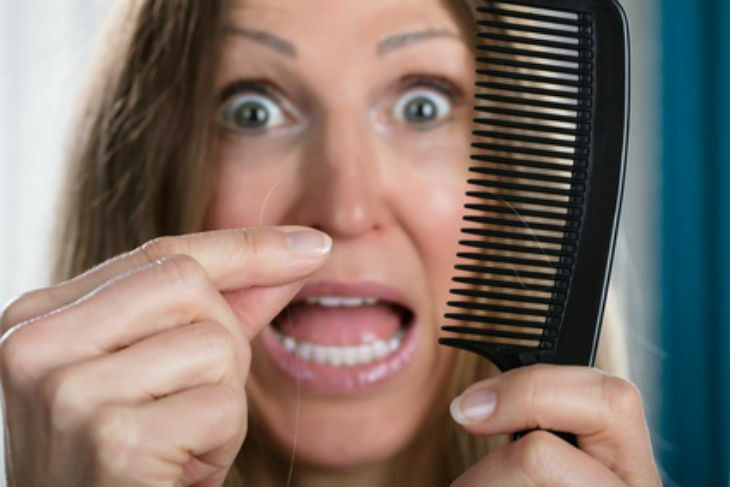 When this goes on, the hair follicles will continue to decrease, leading to the production of shorter and thinner hair. The increase of zinc levels may also lead to the reduction of vitamin and mineral absorption. These include minerals such as magnesium, iron, and selenium, which are crucial to hair growth and functioning of the body. Optimal zinc levels will regulate the production of DHT. It also assists in regulating the hormones making it effective in preventing hair loss. Additionally, zinc will also play a crucial role in the production of RNA and DNA that allows the follicle cells division. This is crucial, as it will improve the structural integrity of the hair, leading to proper growth and healthy look. Nuts are excellent sources of nutrients and minerals that are crucial to retaining the natural color of the hair. Consuming them on a regular basis will also help in strengthening the hair. The nuts are rich sources of the alpha-Linoleic acid(2), which is an omega three fatty acid, which is crucial in conditioning your hair. Also referred as aphrodisiacs, oysters are zinc powerhouses allowing your hair to grow. In just three ounces of oysters contains about 493 percent of the zinc you need for daily consumption. The oyster’s aloe offers your body with protein which is great in replacing the broken hair that is shed away because of excess heat, environmental pollutants as well as chemicals in hair care products. Chickpeas such as Garbanzo beans are also great sources of protein, zinc, and vitamin B6. The protein is crucial for hair growth while the Zinc will do a great job of preventing hair loss and dandruff. You can simply add them into vegetarian dishes, curries or make a hummus for a nutritious boost of protein and zinc. Additionally, consuming other beans such as the lentils will also offer your body with iron, zinc, protein, as well as biotin. The sweet potatoes are popular superfood that contains various minerals and vitamins including zinc, Amino 3 fatty acids, phosphorus, magnesium, sodium, potassium, and vitamins A, K, C, E and B. they are also great sources of beta-carotene which is one of the most powerful antioxidants that helps in skin and hair growth. These are excellent sources of protein, B vitamins, biotin, sulfur, zinc, iron, as well as selenium. To maintain the healthy hair you should make eggs part of your breakfast. You can enjoy them just the way you like them whether boiled, scrambled, or poached. Last but not the least we have the carrot. This is another superfood that is great for everyone. Spinach is great sources of iron, folate, zinc, as well as beta-carotene, which aids in the healthy growth of hair. You can add it to your juice blend or add it to your salad. The spinach has a mild taste making it a great choice to add to your salads as well as smoothies. As you can see, it is crucial to ensure that your body has enough zinc to help in hair growth. The keyword here should be the right balance as too much or too little of zinc will affect the hair growth negatively. By consuming the above-mentioned foods, you do not need to look for supplements to get zinc. They are a perfect blend to bring you the right amount of zinc, vitamins, and other nutrients that are needed for healthy and beautiful hair.